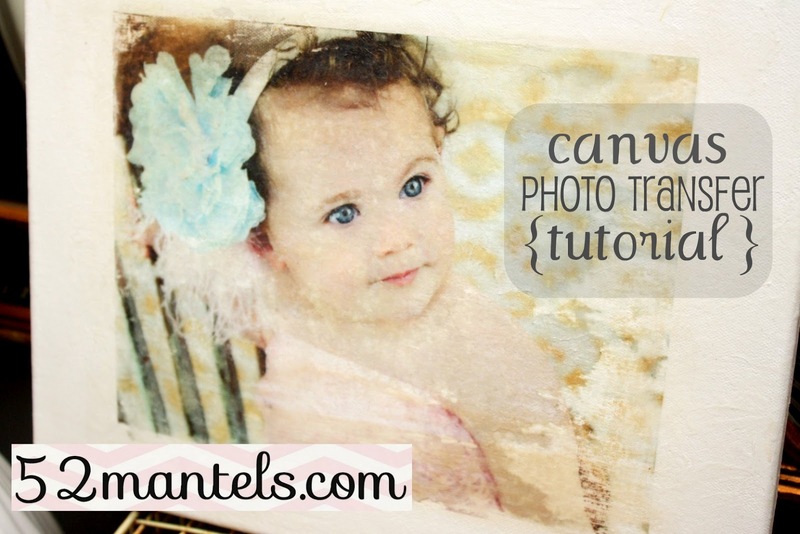 Last month I shared this Canvas Photo Transfer tutorial over at Lolly Jane (aren't those sisters cute?! ), and today I'm sharing it here in case you missed it. 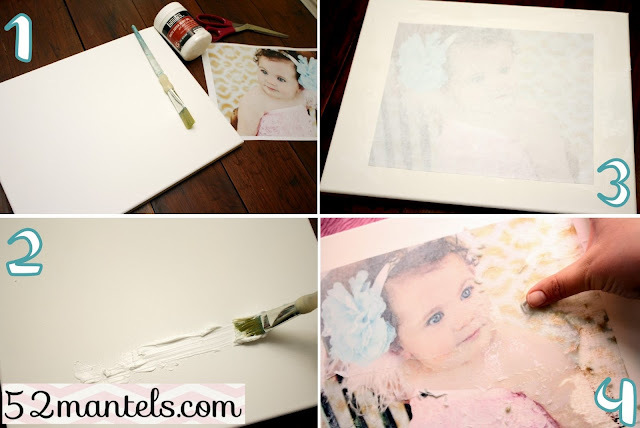 This is such a fun tutorial for easy artwork using your personal images and a home printer! 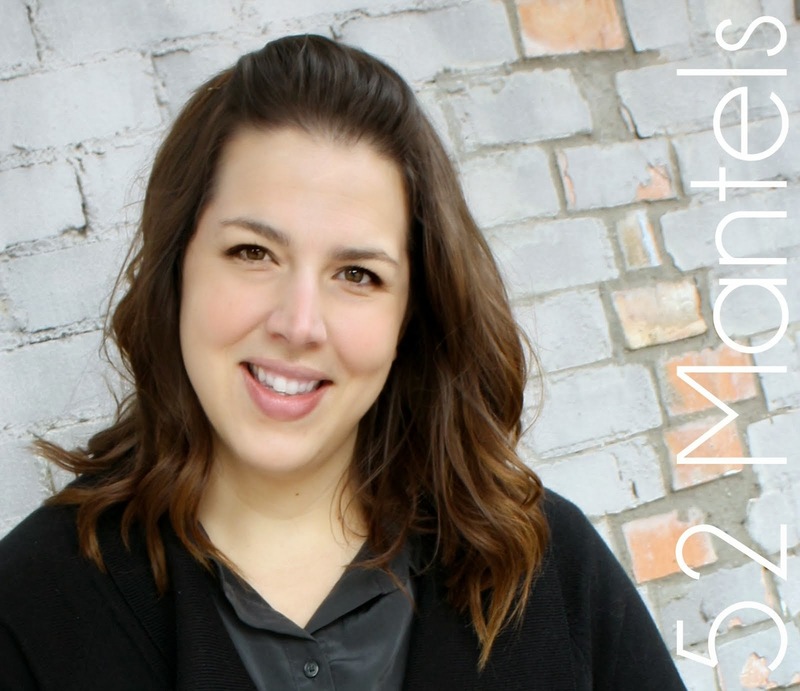 My baby girl turned one in February (of course, I shared all the "tweet" birthday details with you!) and I wanted to display one of the photos from her 1 year photo shoot. I remember seeing this tutorial on A Beautiful Mess awhile back, so I decided to give it a whirl. I love the way it turned out! 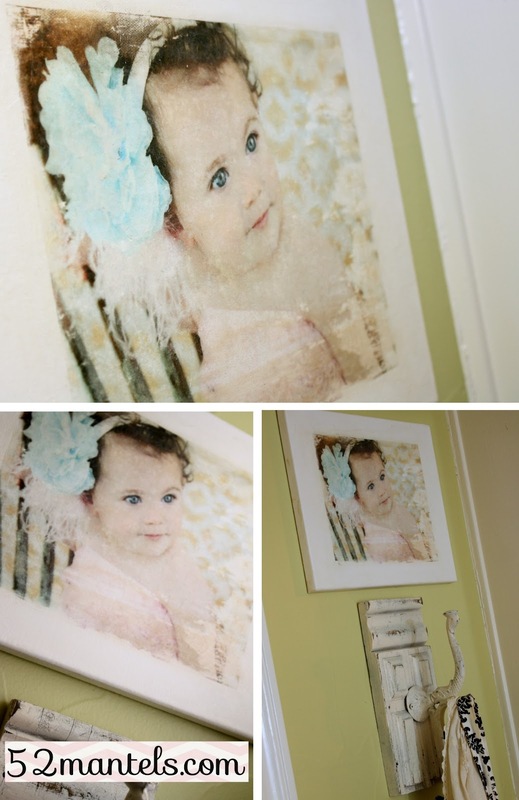 Basically, to create a canvas transfer, you take a printed copy of a photograph (see note at end of post!) and, using a gel medium, transfer that image to a blank canvas. Due to the method of transfer, your image takes on a beautifully aged appearance. **please note, the original image has my daughter facing the other way. In my haste, I forgot to tell my printer to print a mirror image. Don't skip this step, especially if your image has words in it! 3) Press a copy of the photo, image side DOWN, onto the canvas, making sure to center it and then smooth out any bubbles or wrinkles. Then...walk away for 6 or more hours before going on to step 4! 4) After 6+ hours, sprinkle your canvas with water (I just used my finger tips to do this, but a water bottle would have been even better!) and begin rubbing the paper from the canvas, leaving the image on the canvas. This is the trickiest part of the entire process! Be extra gentle as your rub and peel the paper from the canvas. **A few tips: Do NOT over-wet your canvas or over-rub one area. The spot in the lower right corner is where I used way too much water and the brown blur in the top left hand corner is a spot where I rubbed too aggressively. Learn from my mistakes! Also, be especially careful over faces. It would be very easy to distort the face by excessively rubbing. Imagine your cutie pie with only one eyebrow or no nose. Yikes! Be extra delicate in that region. 5) When the paper has been peeled from your canvas and the image is completely dry, paint a thin coat of the gel medium over the entire canvas. After the first coat dries, go over your canvas in short, back and forth strokes, leaving random peaks in the gel. This will add texture to the canvas and give it the look of a painting. The gel will go on white, but dry clear and matte. This process might sound complicated, but it's really not! It's a lengthy project only because you must allow the gel to dry between steps. I started one evening, let it dry overnight and finished the next day. It was SO worth the time, though! Got any cuties you'd like to put on a canvas?? Update: my initial tutorial said to use a laser printed copy of a photograph. That's what Elsie from A Beautiful Mess used. However, my hubby has recently informed me that our printer is an inkjet printer!! Ha! I'm such a dork. So, the moral of this story is that this process appears to work with both laser printers and inkjet printers. Great to know! Very cute! I must give this a try! I really like how it looks a little worn. Great tutorial. Oh my goodness this turned out looking awesome!! That looks great! By the way, I LOVE the hook below the photo canvas! Thanks for sharing this tutorial. I've pinned it! Gorgeous, gorgeous picture of your cutie pie, by the way! Pinned this tutorial. Now I just need an adorable picture of an adorable baby girl! This looks like a great idea. Yours turned out beautifully -- well, you certainly had an adorable subject! Emily, this is gorgeous! Just gorgeous! 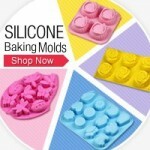 can you use mod podge on this or do I need the gel medium? This is great! Do you think it would work on a wood surface? Do you think mod podge would work?